Although the relationship between a microbead’s size and its environmental impact has not been fully studied, Associate Professor Obbard says studies done with his students a decade apart have found that this pollution is present, and increasing, all over Singapore. Plastic particles were detected in beach sediment at four of seven beaches – St John’s Island, Pasir Ris, East Coast Park and Kallang River, in seawater at the Republic of Singapore Yacht Club and Kranji, and in all seven mangrove habitats sampled at Berlayar Creek, Sungei Buloh, Lim Chu Kang and Pasir Ris. While little work has been done on what level of microplastic might be hazardous, scientists are concerned because it is so widespread. “20,000kg of trash in one day of coast clean-up,” by David Ee. The Sunday Times, 28 Apr 2013. A record 20,000kg of trash was cleared off beaches and mangroves during an annual one-day clean-up by International Coastal Cleanup Singapore (ICCS) last September. This was double the amount collected in 2008, and more than triple that of a decade ago. Not all the trash, however, is locally generated, ICCS lead coordinator N. Sivasothi told The Sunday Times. Some is carried by sea currents from Malaysia and washes up on our shores, he added. The National Environment Agency (NEA), which oversees the cleanliness of beaches in Singapore, confirmed last week that flotsam on coastlines here is brought in by wind and tides from the region, or passing vessels. And as the ICCS’ growing band of about 4,000 volunteers cleans up new sites – for example, previously uncleaned coastlines such as Lim Chu Kang East mangrove – more trash is discovered, some of which has lain there for years. Even so, Singapore’s littering problem is real, said Mr Sivasothi. 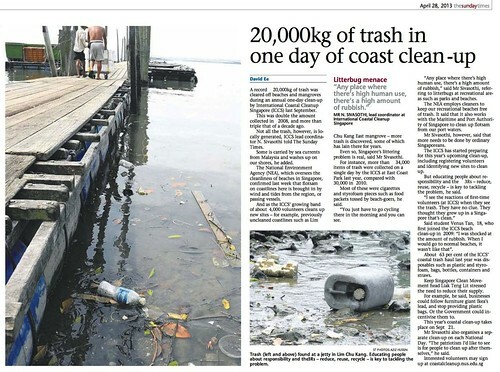 For instance, more than 34,000 items of trash were collected on a single day by the ICCS at East Coast Park last year, compared with 30,000 in 2010. Most of these were cigarettes and styrofoam pieces such as food packets tossed by beach-goers, he said. “You just have to go cycling there in the morning and you can see. “Any place where there’s high human use, there’s a high amount of rubbish,” said Mr Sivasothi, referring to litterbugs at recreational areas such as parks and beaches. The NEA employs cleaners to keep our recreational beaches free of trash. It said that it also works with the Maritime and Port Authority of Singapore to clean up flotsam from our port waters. Mr Sivasothi, however, said that more needs to be done by ordinary Singaporeans. The ICCS has started preparing for this year’s upcoming clean-up, including registering volunteers and identifying new sites to clean up. But educating people about responsibility and the 3Rs – reduce, reuse, recycle – is key to tackling the problem, he said. Said student Venus Tan, 18, who first joined the ICCS beach clean-up in 2009: “I was shocked at the amount of rubbish. When I would go to normal beaches, it wasn’t like that”. About 63 per cent of the ICCS’ coastal trash haul last year was disposables such as plastic and styrofoam, bags, bottles, containers and straws. Keep Singapore Clean Movement head Liak Teng Lit stressed the need to reduce their supply. For example, he said, businesses could follow furniture giant Ikea’s lead, and stop providing plastic bags. Or the Government could incentivise them to. This year’s coastal clean-up takes place on Sept 21. Mr Sivasothi also organises a separate clean-up on each National Day. “The patriotism I’d like to see is for people to clean up after themselves,” he said. Thanks to Adrian Loo for the image, and WildSingapore for the news text. “I VISITED Sungei Buloh Wetland Reserve on Sunday morning with my family. I had not been there for four years and was looking forward to enjoying the flora and fauna of this nature reserve. While I was not disappointed in terms of the service (the woman at the visitor centre was friendly and helpful), I was quite aghast to see the amount of trash floating on the water – plastic bottles, styrofoam boxes and even a beach ball, which were really an eyesore. “WE THANK Ms Cindy Tan for her compliments about our service staff and her feedback (‘Litter turns wetland reserve into an eyesore’; last Friday). The litter Ms Tan saw in the waters surrounding Sungei Buloh was flotsam that gets carried into Sungei Buloh by the tides. To keep flotsam away from Sungei Buloh, we have installed a boom at the mangrove boardwalk. Our contractor carries out daily cleaning. To supplement this, a number of corporations and schools have partnered us to carry out regular clean-ups of the coastal area. OBS conducted their inaugural ICCS’ efforts At Pulau Ubin with their alumni volunteers last Saturday, 3rd September 2011. Volunteers stayed overnight for a comprehensive programme which involved briefings, discussion, review and sharing before heading out to five beaches in western Ubin. Congratulations on completing a comprehensive ICCS programme, OBS! I sent this out yesterday morning to all our Organisers and Volunteers on the mailing list. I added the hyperlinks and Kate’s photo of the bloody syringe to the email text. during a recent mangrove cleanup at Kranji Mangrove, the Singapore American School (SAS) found 33 syringes which was unusual for a mangrove site. This was highlighted by their teacher in charge, Kate Thome, at a talk to her students. This was subsequently (and helpfully) reported by The Straits Times in the article published this morning which I add below. Photo of bloody syringe at Kranji Mangrove by Kate Thome. In this cleanup, the discovery of the syringes was a non-event because of the good preparation of the SAS students and the familiarity of the NParks officers overseeing the cleanup. The original US guidelines were already mature by the time Singapore adopted the programme in 1992. But guidelines can be just words to some. In the early years Kate was a strong advocate of safety. I guess as a mum and teacher, this was second nature to her! We have continued that tradition of exhortation in ICCS. We tell Organisers that at the very least in their first year, they must aim to be safe and efficient, i.e. take care of participants and get that data submitted. This will be our 20th year of the ICCS and we will be reminding Organisers to be well prepared for their responsibility and for volunteers to be mindful of the safety briefing conducted that very morning. The annual ICCS Workshop (July) for Organisers highlights and revisits issues about safety, management, data and education. I am glad to see Organisers meet, discuss and share stories with Zone Captains at these event. It is a useful way to remind ourselves of the issues and bring about some focus before the event in September. The annual ICCS Briefing (August) for volunteers covers safety, data and education and Organises are encouraged to send their leaders and assistants to the session. We see 200-300 annually and if need be, can take up to 500 at the NUS Lecture Theatres! So we have the mechanisms in place to enhance our safety awareness, the way it was done for me back in 1997. So do make use of the opportunity when we send out the registration invitations for these events. In addition to preparing all of us, the Zone Captains, Site Captains and myself enjoy the opportunity to interact and get to know you as it is a fellowship of people who care for the environment and do something about it! Have a great Friday everyone and a lovely weekend! 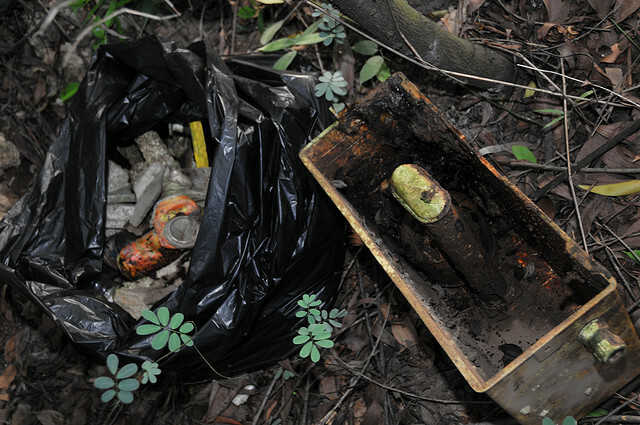 STUDENT volunteers on a coastal cleanup of a Kranji mangrove swamp on May 24 found litter more sinister than the usual plastic bottles and food packaging – more than 30 used syringes, with needles still attached. The National Parks Board (NParks) could not confirm whether the syringes were found clustered together or scattered across the area, but said this was the biggest number of syringes found in a single cleanup session. NParks director of conservation Wong Tuan Wah said it is usual to find a syringe or two in each cleanup, but small items such as food and drink packaging or large items like refrigerators are more typically part of the haul. When contacted, the Singapore American School (SAS), whose students made the find, declined comment. It would say only that its students are briefed on the precautions to take on such cleanups and are under constant adult supervision. It is understood the students did not touch the syringes, but had alerted an NParks duty officer. Mr N. Sivasothi, coordinator of International Coastal Cleanup Singapore (ICCS), which has worked with SAS on such trips to the mangroves for the past 20 years, suggested that the syringes could have been washed up, rather than the result of a gathering of drug abusers in the swamp. ‘The probability of recreational drug users going to the mangroves is very low. At night, it’s very dark, and that part of the Singapore shoreline is not very hospitable,’ said Mr Sivasothi, a researcher at the National University of Singapore whose area of interest is mangroves. The ICCS, which organises coastal cleanups, finds between 30 and 150 syringes a year, most of them on the shores of what are known as ‘recreational’ beaches, such as East Coast Park and Changi, he added. NParks said its officer-on-site during cleanups requires all volunteers to put on the rubber boots and gloves provided before each exercise. Doctors The Straits Times spoke to said the possibility of infection is high if one is pierced with an infected needle. Khoo Teck Puat Hospital senior consultant Christopher Willis said: ‘The most practical way to deal with this is to look around for an empty plastic bottle with a cap, then carefully deposit the needles into the bottle and close the cap. It is also safe to deposit the bottle in a rubbish bin, he added. The Central Narcotics Bureau (CNB) advises members of the public not to handle syringes or needles that they suspect to have been used for drug abuse. The police should be alerted, it said. Drug abusers here do not commonly ‘shoot up’ their fixes, but anyone caught with syringes intended for abusing drugs faces up to three years’ jail or a $10,000 fine, or both. “Flotsam and Jetsam may be just a pair of evil eels in a popular Disney cartoon movie, but flotsam and jetsam are real problems for Singapore’s beach cleaners. The seaborne garbage – from seaweed to plastic bottles and stuff jettisoned from ships – gets deposited on local shores, thanks to the seasonal monsoons. As much as five tonnes of debris are collected daily from East Coast Park beach during the south-west monsoon from May to October each year. During the off-season, less than one tonne is collected every other day, said the National Environment Agency (NEA). Besides cleaning up the 10.7km East Coast Park beach, NEA also ensures that Changi, Sembawang Park and Pasir Ris beaches are maintained. Changi, which has a 6.2km stretch, can accumulate up to three tonnes of rubbish daily from November to April during the north-east monsoon. Off-season, one tonne is cleared every other day. Pasir Ris and Sembawang Park are affected by the north-east monsoon too. ‘The most debris is at East Coast and Changi. You won’t know this because cleaners are out by 7am to sweep them clean,’ said Mr N. Sivasothi of the International Coastal Cleanup Singapore (ICCS), made up of volunteers from the Raffles Museum of Biodiversity Research of the National University of Singapore. ICCS adds to NEA’s efforts by organising coastal cleanups as well. Yesterday, more than 3,000 volunteers from over 60 schools, institutes, organisations and government and corporate bodies took part in cleanup efforts across the island to mark the International Coastal Cleanup (ICC) day. This year’s programme has attracted more than 4,000 volunteers, and will take place over three weekends. ICC is an annual event conducted on the third Saturday of September in up to 100 countries. Coordinated by the non-profit United States-based agency, Ocean Conservancy, it is now into its 25th year. It aims to remove debris and collect data on it – from shorelines, waterways and beaches worldwide. During last year’s ICC day, over 3,000 volunteers here picked up more than 13 tonnes of trash from 20km of coastline. The volunteer team that coordinates the ICC in Singapore also helps to conduct other cleanups here during the year, especially at mangrove and sandy shore areas that are not cleaned daily. A spokesman for NEA said it spends about $1.4 million a year to clean the four recreational beaches here. During the monsoons, cleaners scour the beaches twice daily; otherwise, they do it once daily or every other day. A team of cleaners starts work as early as 6am, and the process can take as long as six hours. Because of the size of East Coast Park beach and the level of human activity, up to 30 cleaners are needed to help clear the debris. The other beaches require between three and 10 cleaners. One cleaner drives and operates a machine that scoops up the litter, while the others, such as Mr Mahmood Amin, collect the litter manually using rakes. ‘Some of the stranger items I’ve picked up are car tyres and huge tree branches. I enjoy the work, but it would be nice if people helped by not littering,’ said the 38-year-old, who has been a cleaner for more than a year. Collected debris goes straight to incineration plants and the Semakau landfill. NEA’s spokesman said that other than seaweed, debris brought in by the tides is the waste thrown into the sea by people. Earlier this month, NEA released findings of a survey of water samples which showed that the waters off Pasir Ris contained unsafe levels of enterococcus, which can cause gastro-intestinal illnesses with vomiting and diarrhoea if swimmers come into contact with it. The spokesman said the removal of debris along beaches will not affect the enterococcus count of water, as the bacterium is found in the faeces of humans and warm-blooded animals. Ms Nicola Carter, 44, who visits East Coast Park beach occasionally, thinks the cleanliness of Singapore’s beaches can be improved on. ‘When the tides go down, you can see plenty of trash, especially at the more popular areas. Individuals have a responsibility for keeping the beaches clean,’ said the sales manager. Mr Sivasothi encourages the practice of ‘the three Rs’: Reduce, Reuse and Recycle. He said: ‘Semakau’s landfill is where the ash of our trash goes to. SITUATED off the West Coast, Pandan Mangrove has become the latest addition to the coastline being cleaned up by International Coastal Cleanup Singapore. Fresh pickings could be the main reason for the unusually high number of bulky items found on just 350m of shoreline. More than the average number of tyres and building materials were found stuck in the mud. In all, 3,448 pieces of trash were collected by corporate volunteers from Oil Spill Response and East Asia Response Limited (OSRL/EARL) and Wildlife Reserves Singapore – both new to coastal cleanups – and veterans from the Raffles Museum Toddycats of the National University of Singapore, a non-governmental organisation headed by zoologist N. Sivasothi, who coordinates the annual event. ‘We wanted to give them this fresh site, even though they have never done this work before, because they had a great ‘can-do’ spirit and were serious about wanting to do a good job,’ he said. ‘We wanted to cover only a small site because we wanted to minimise the damage to the site,’ said site captain Kelly Ong, 27, a marine biologist. The volunteers found almost 1,300 plastic bags, 820 food wrappers and more than 440 glass bottles. ‘The most peculiar items found included traffic barrier lights, half of a vacuum cleaner, a rice cooker, a wooden statue of a smiling Buddha, a golf bag and a lot of plastic pipes,’ she said. A human chain was formed to remove 39 tyres, which easily weighed about 740kg. Ms Ong hopes this will reduce the places where rainwater can collect, as these can serve as breeding grounds for mosquitos. Mr Wilson Tan, 28, who headed the OSRL/EARL team, said he had been searching for a way to help his company reduce its carbon footprint. ‘I went online to check if anyone was cleaning the beaches because the footprint is worse if trash is left in the open. It affects the mangroves and the marine life,’ he said. Note – the volunteers mentioned are Site Captains of Sembawang Beach (Yasim), Kranji mangroves (Wei Siong) and Pandan mangroves (Kelly) and cleanup organiser Wilson.